Showing results for tags 'Wheatstone'. I am looking to sell my Wheatstone Anglo Concertina serial number 27962 - made July 9th 1919, restored last year. This is from around what is known as the Golden Era of Wheatstone concertinas. http://www.horniman.info/DKNSARC/SD01/PAGES/D1P1190S.HTM Full resolution photos - here I love this concertina, both to look at and to play, but sadly I've moved from England to Canada and I need to raise some funds to clear some outstanding debt from the move. The concertina has been restored and is in perfect working order - see below for more details. - All woodwork refinished with a subtle French polish - Button holes re-bushed - Reeds touch tuned by Mark Lloyd Adey (link) - BRAND NEW Bellows, again made and fitted by Mark Lloyd Adey, featuring vintage style gold foil papers (link) - New leather, gold foiled hand straps with felt backing - Custom made padded and blocked leather case included by Simon Brock (link) Looking for $5500CAD which works out to be about £3250GBP or $4170USD. Any shipping is at an extra cost (directly added from the shipper) and must include shipping insurance. The concertina is located in Brantford, Ontario Canada and I am happy for you to come visit and play if you are interested. Will be nice to hear it played by someone who knows what they are doing for a change Any questions please do message me. Watson's Scotch Measure on BT English Concertina. The Flowers of Ashgll & Alston Flower Show! Good morning all from Dallas, Texas, I am a church musician and beginner English concertina player. Purchased a preowned Jackie last Christmas and have played it almost daily since then. I have been reading and researching on this site and learning from this community with much appreciation. I must confess that I'm beginning to think about purchasing that "next level" of English concertina. I've begun to focus on searching for a 48key treble Wheatstone or Lachenal english concertina in the range of $1,000-2000. (According to one site, that's 774-1548 GBP). I have not had an opportunity to play either instrument so I look forward to doing so. I'm going to be in Cambridge and Edinburgh in October and hope to be able to play some instruments. Two questions: 1. Are there significant differences in the Wheatstone and Lachenal instruments (touch, sound)? 2. If you have something for sale in the price range, will you private message me? Thank you in advance for your responses. 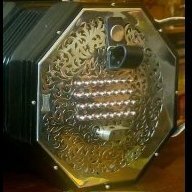 Hello concertina lovers, I am selling my Wheatstone Miniature Maccann Duet Concertina. I have a listing on ebay, check it out if you are interested. https://www.ebay.com/itm/302791718981?ssPageName=STRK:MESELX:IT&amp;_trksid=p3984.m1558.l2649 It is an amazing 12 keys Wheatstone Miniature Maccann Duet Concertina, serial number: 32154. From the serial number, we can estimate that it was made around 1929. It is in an incredible condition. All actions, pads, metal buttons, steel reeds and 8-fold bellows are impeccable. The metal ends are beautifully sculpted. It is "concert pitch" tuned and it sounds great. It is surprisingly powerful for the size (4.5 inches / 3 inches). I bought it from Chris Algar at Barleycorn Concertinas. It will come in the original box which is also in an amazing condition. If you have any questions or would like additional photos, don't hesitate to ask me. Looking to sell this concertina. Several of the keys are sticky and it's missing the straps. I have an excellent example of a mid-20th century Wheatstone (serial no. 52241) for sale, with rosewood ends and metal buttons. It is tuned to C/G, action, tuning, and general condition all very good. It has a mellow tone which has proven good for both Irish tunes and song accompaniment in my use of it, and I am only selling due to recent purchase of a Jeffries. I will post up photos when I get a chance, otherwise if anybody is interested to meet and try it out, I will be in Edinburgh for the next couple of days and then in Cork. Asking 2,250 euros, or £2,000. With considerable regret, need to sell these two instruments. Duet is full-sized; anglo is 3-7/8" across flats. Little played, and stored carefully for some time - playable now but need exercise. Prefer to sell in person if at all possible, or via reliable intermediary. Location: Boston, MA USA. Please message privately for any required information. Advice on current pricing will be much appreciated. If sold to or through anyone ehere, will donate appropriately to site management. Thanks in advance for your interest. May the music continue forever! Concertina Lovers, This one is for collectors, it is extremely rare. 12 keys Wheatstone Miniature Maccann Duet Concertina, serial number: 32154. it was made around 1929. It is in an incredible condition. All actions, pads, metal buttons, steel reeds and 8-fold bellows are impeccable. The metal ends are beautifully sculpted. It is "concert pitch" tuned and it sounds great. It is surprisingly powerful for the size (4.5 inches / 3 inches). I bought it from Chris Algar at Barleycorn Concertinas in 2006. Played very occasionally. It plays just like when I got it. It will come in the original box which is also in an amazing condition. Check out the eBay auction: http://www.ebay.com/itm/Amazing-Wheatstone-Miniature-Maccann-Duet-Concertina-/302266299377? If you have any questions, please don't hesitate to ask me. Aeola And Model 5 - My "two For The Road"